In one of my earliest posts, I wrote about the Cinnamon Loaf Coffee Cake that I used to make when Dad was coming over. It was always one of his favourites. 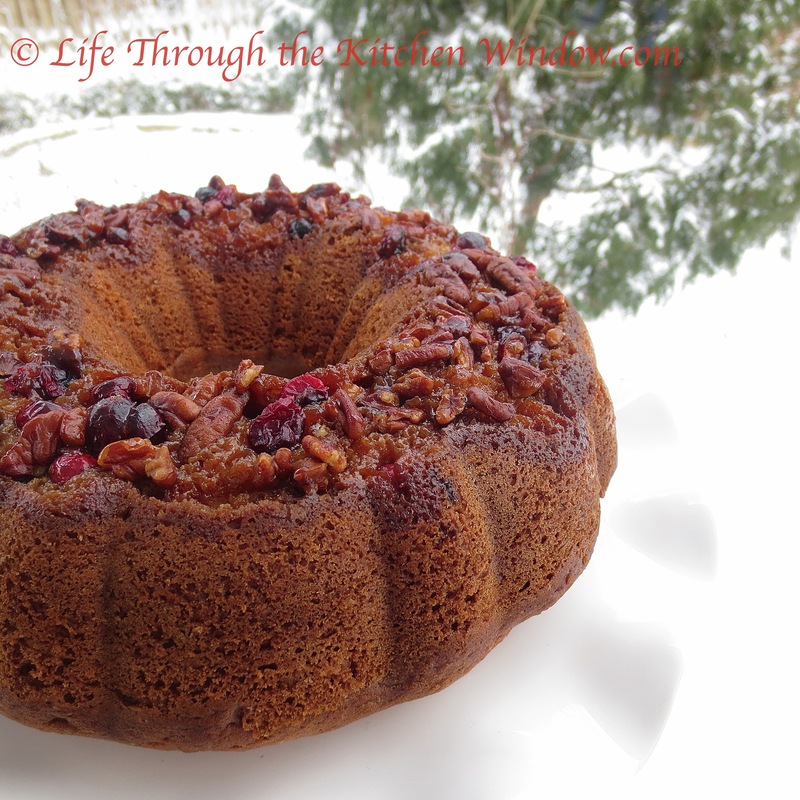 Lately I’ve been adapting that recipe to come up with a variety of different coffee cakes. 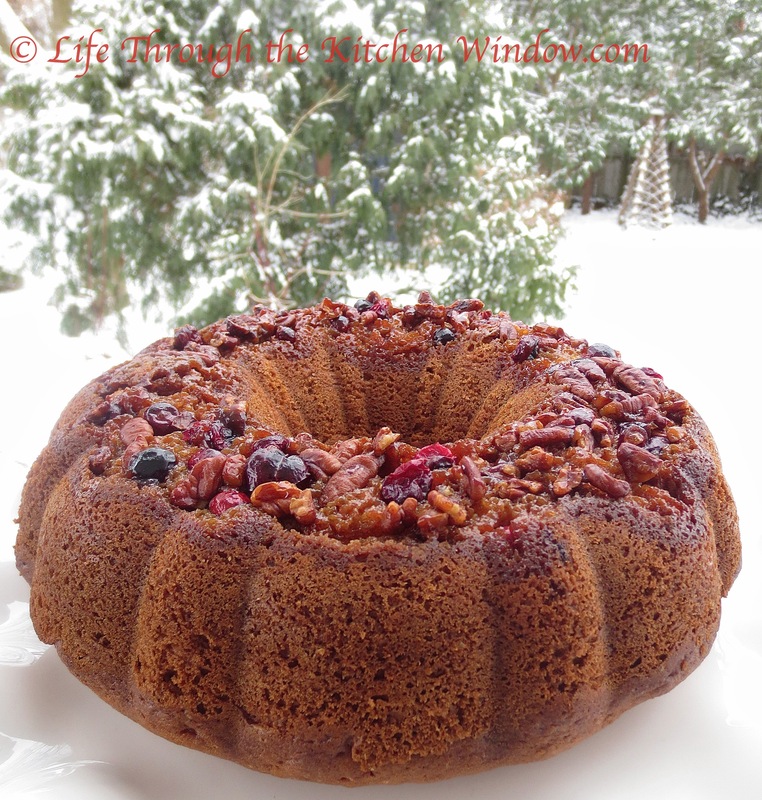 For Christmas, I used sour cream to enrich the cake, and baked it in a bundt pan with a sweet pecan filling and a cranberry and pecan topping. No matter how much I play with the recipe, one thing remains constant: coffee cake reminds us all of Dad. Pre-heat oven to 350ºF. Generously butter a bundt pan (I don’t flour it in case it changes the appearance of the topping – I guess I should check that out some time). First, prepare the topping. Melt the butter, sugar and syrup together in a small saucepan. Take the pan off the heat and stir in the cinnamon, pecans and cranberries. Evenly pour the mixture around the bottom of the bundt pan. Next, stir together the turbinado (or other sugar of your choice) and the cinnamon, and set aside, along with the pecan halves. For the cake, stir together the flour, salt, baking soda and baking powder in a small bowl and set aside. Cream the butter and sugar. Blend in the eggs and vanilla until smooth and creamy. Since this is a special cake, this would be a good time to add some love. Then stir in one-third of the flour, followed by half of the sour cream, and repeat until it’s all incorporated and the batter is smooth. Don’t over-mix as this could toughen the cake. To assemble, spoon about half of the batter over the topping. 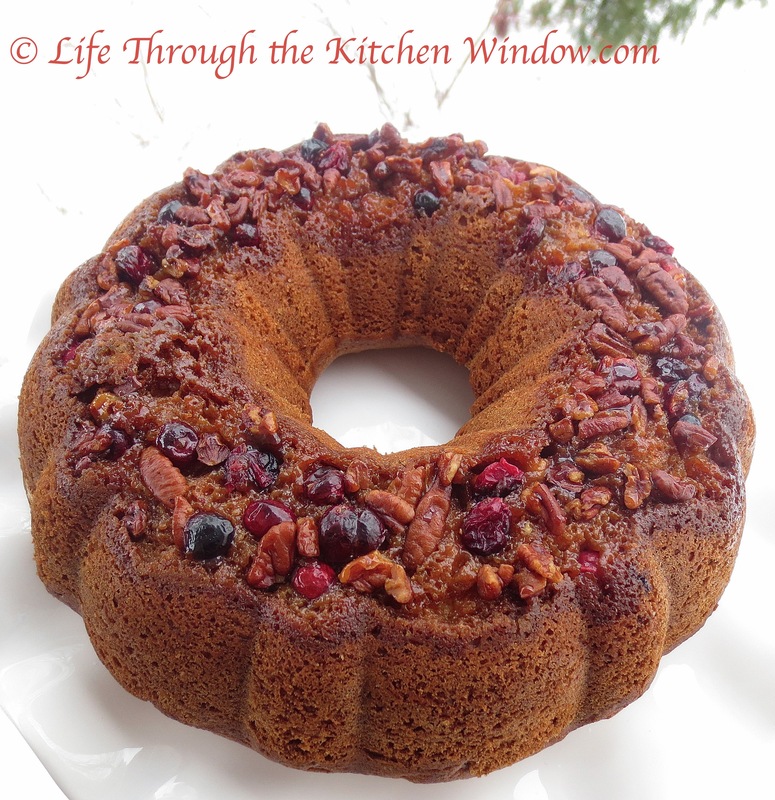 Gently smooth to the sides of the pan, trying not to disturb the pecan and cranberry mixture. Arrange the pecans on the diagonal in a track, so to speak, around the middle of the cake. Then spoon the sugar mixture directly over the top of the pecans. Dollop the rest of the batter all around the pan, smoothing gently and doing your best not to disturb the filling. Bake for for 50 minutes to an hour. A toothpick inserted will come out clean when the cake is done. You’ll see in my photos that some of the cranberries look, ahem, a little overdone. I realized partway through the baking that I had the oven set on convection bake, which intensifies the baking process. My advice to you is not to do that. Oh yum, that is a coffee cake I could fall in love with. How lovely, that it always reminds you of your dad. Thank you, Karen. Food has such evocative powers, doesn’t it. Love that you connect with your dad through the memories of food. I think the cake looks wonderful! Thank you, Lisa. Food is such a powerful conductor of memories (and this cake tastes good too 😊). Thank you for visiting and commenting. I love the addition of maple syrup to the topping, I hadn’t thought of doing that! A friend gave us a few bottles of maple syrup so I was looking for ways to use it! Thanks for stopping by and commenting.